If you’ve seen the British horror film ‘Night of the Demon‘, you’d see some good similarities between the two, but Sam wanted to make a movie about a pleasant and very nice individual who makes one bad decision out of their very own greed, which comes back to haunt them in a the most horrific way. ‘Drag Me To Hell‘ centers on a young woman named Christine (Alison Lohman), who is a sweet and well-mannered loan officer at a bank. She’s kind, funny, and has a good boyfriend she loves (Justin Long). Her boss at the bank is always riding her to make the “hard decisions” in order to keep bank profits up and not allow people who need help with extensions or past payments. Christine doesn’t agree with this sentiment, but when an elderly gypsy woman comes in and kindly asks for an extension on her house, Christine does not allow it in order to impress her boss and gain a small promotion. The old gypsy woman, played perfectly by Lorna Raver, curses Christine to hell for eternity. The rules are that Christine is now in possession of a button from the gypsy woman and must pass the button along to someone else within three days or she will be devoured by demons in a fiery hell below forever. Of course, none of this seems believable, but when strange and terrifying things start happening, Christine must try to make things right. The film is rated PG-13, which for a horror movie on Sam Raimi’s watch, isn’t the way to go, but Raimi wanted to do something different and rely on a psychological horror rather than a ton of gore. Needless to say, Raimi succeeded here on all levels. His ability to show shadows behind doors or evil footsteps lurking is highly suspenseful and works in each scene here. The more potent scares are in your face and downright terrifying, which might leave you nervously laughing at any moment. With the horror genre, Raimi perfectly inputs his comedic genius that rallies behind that of ‘The Three Stooges’ and some other off-beat dark humor, which is such a delightful and delicious mix of dialogue and gore. The performances are all solid, but the person who stands out is by far Lorna Raver as the old gypsy woman. Raver is a stage actress who is sweet and kind, but in this film, she is ugly, ruthless, and scary-as-hell. It’s a great transformation and Raver just jumps into the deep end with her character and never swims back to the edge. At it’s core, ‘Drag Me To Hell‘ is a tale of morals and ethics, where you might be a sweet and kind person, but even one slip up and come back to bite you. It’s a damn fine message and premise that will make you laugh and hide under the covers with the lights one. This is how you do a horror movie right. The Video: ‘Drag Me to Hell‘ comes with a 1080p HD transfer and is presented in 2.40:1 aspect ratio. In fact, this is a brand new HD transfer than what was presented on the original Blu-ray a few years ago. This one is taken from the 2K digital intermediate. The new video presentation looks very good with some great colors and detail. Colors look more realistic and more subdued as they should be here with the exception of a few certain colors. A lot of the film is set in a dark rooms or at night, so bright primary colors aren’t huge here. But the darker colors of green, browns, and blues all stand out with varying shades. All of the different vomit and gooey insides do stand out though. That scene where blood spurts everywhere at the bank is incredible looking with bright reds. At the end of the film, you’ll see the amazing orange and red flames from hell pop up, which look bold. Detail is incredible as well, and none of the darkly lit scenes hinder detail. The makeup effects on the old gypsy woman are clear and vivid, showing all of the bruises, wounds, and scars nicely. Even her teeth with all of the mold and cracks show up here. Wider shots also look great and never go soft. CGI effects look decent, but are never too realistic. The black levels are very deep and inky and the skin tones are natural too. There were no further compression problems either with this new transfer. The Audio: There is no new Dolby Atmos track here, but rather the same lossless DTS-HD MA 5.1 mix, which is still very good. This is one of those horror films that utilizes every horror noise perfectly. Doors creaking open, footsteps from around the room, growls and demonic sounds, as well as harsh winds blowing are all robust and loud. Each of the horror sounds have excellent directionality and pack a punch when one of the character is hurled at the wall or taken down. There are plenty of moments where the scene is eerily quiet, but then a big boom of sound comes across the soundscape and scares us completely. It happens often and is very effective. Ambient noises of people talking at the bank or in the train station, as well as some other supernatural forces all sound great. The score always adds to the intense and horrific situations and is quite memorable without drowning out any other sound aspect. The bass kicks in throughout the entire film and will rumble the walls. The dialogue is clear and easy to follow and free of any pops, cracks, hiss, and shrills. To Hell and Back: An Interview with Actress Alison Lohman (HD, 13 Mins.) – In a brand new interview, Alison Lohman talks about working on the film, her stunt work, performing with the other actors, and working with Sam Raimi. There is some onset footage included. Curses! : An Interview with Actress Lorna Raver (HD, 16 Mins.) – The very sweet Lorna Raver discusses working on the film. She’s never been in a horror movie before, but talks about how she brought the character to life. She loved it and even does some impressions of her character in the interview. Onset footage is included. Hitting All the Right Notes: An Interview with Composer Christopher Young (HD, 17 Mins.) – The composer of the film talks about making the music for the movie, his influences, how he’s worked with Raimi before, and the right feel for this comedy/horror masterpiece. Still Gallery (HD, 2 Mins.) – A collection of production photos and shots from the film. Video Production Diaries (HD, 35 Mins.) – A collection of on set footage and behind the scenes featurettes hosted by Justin Long. These are fun to watch and give us a glimpse into how the film was made, but it’s all too brief. You really want more from this. 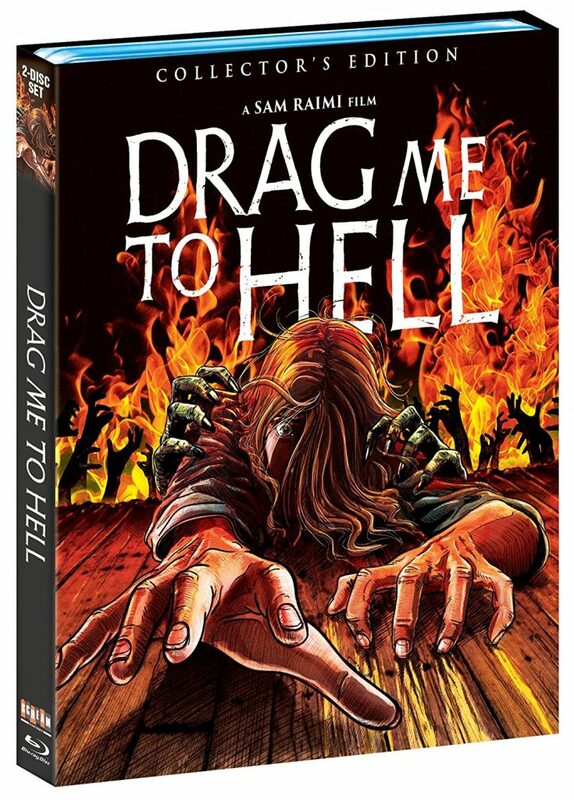 This 2-Disc ‘Drag Me To Hell‘ Blu-ray Collector’s Edition is definitely worthy of an upgrade. The image and audio itself are far better since both cuts of the film are separated on two discs, allowing for more room to breath. The film still holds up after all these years and is equally terrifying and funny with some excellent performances. 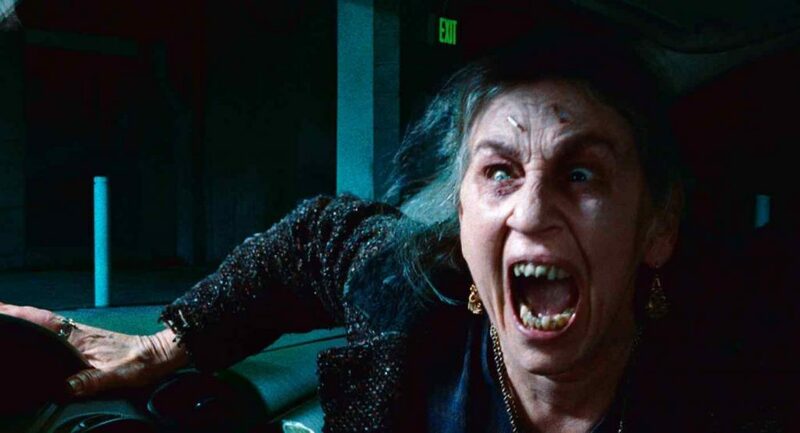 Sam Raimi has perfected the art of the scare and makes us laugh without crossing into silly territory. The new extras are all worth watching, while the old one is still fun to watch and imported over as well. Highly Recommended! This entry was posted on Monday, January 29th, 2018 at 3:38 pm	and is filed under Film, News, Podcast. You can follow any responses to this entry through the RSS 2.0 feed. You can skip to the end and leave a response. Pinging is currently not allowed.